In September 2008 we took a 6,718 mile 23 day trip from Durham, NC to the western US. The trip took us through North Carolina, Virginia, West Virginia, Illinois, Ohio, Iowa, South Dakota, Wyoming, Montana, and Nebraska. Our major stops were the Badlands of South Dakota, the Black Hills of South Dakota (Mount Rushmore), Glacier National Park, and Grand Teton National Park. We drove through Yellowstone National Park twice and did a little sightseeing. We had time for short stops at other places along the way. It was a great trip, but we both wished we had had more time. We'll just have to find time to do it again. I've driven across country several time and always wanted to take a trip where I could stop and read all the historical markers and visit all the interesting things along the way. This wasn't the trip for this to happen . Too many miles to cover in too few days. We started planning the trip almost a year before we left home. 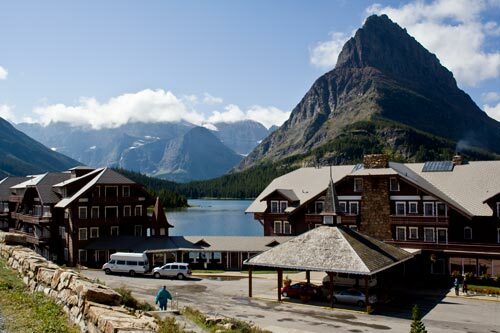 The idea was to maximize the time we had in the Black Hills, Glacier, and the Tetons. Glacier was the place we planned to spend the most time (a full week). We also wanted to route ourselves through interesting places along the way. The final itinerary was to drive from Durham to Indianapolis, IN; then to Sioux City, IA; then to Rapid City SD where we would stay for a few days to see the Black Hills. We then planned a leisurely drive to Spearfish, SD to allow more sightseeing in the area, then a drive to Gillette, WY with a stop at Devil's Tower. From there we would drive to Grand Teton National Park through Yellowstone National Park but without time for major sightseeing in the park. We then had three days in Grand Teton where we planned to paddle Jenny Lake and at least one more lake. 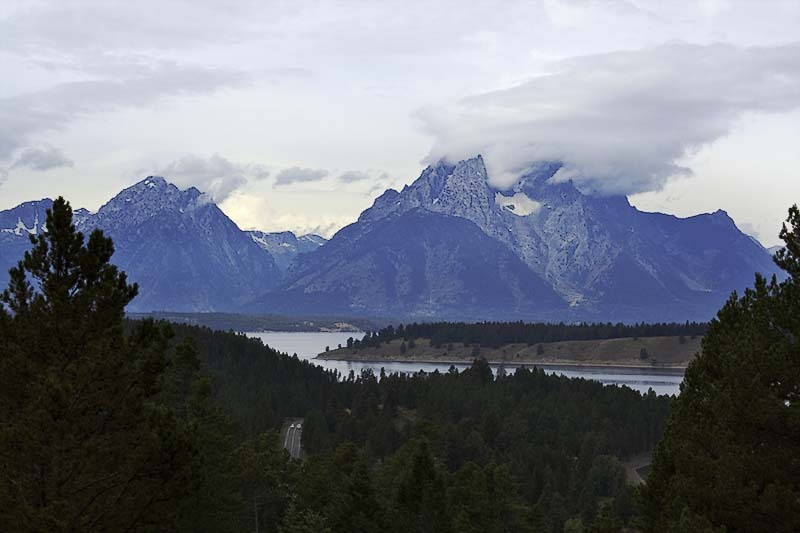 From Grand Teton we planned to drive through Yellowstone National Park and spend the night in West Yellowstone, MT. From West Yellowstone we planned to drive to Whitefish, MT and spend a week in Glacier National Park. 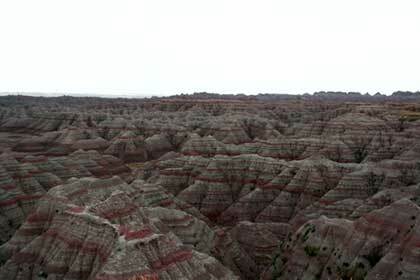 Our planned return was through North Dakota to see the North Dakota Badlands and Theodore Roosevelt National Park. After a couple of days in North Dakota, we planned to return home via Minneapolis, MN and Indianapolis, IN. The planned itinerary involved several 600 plus mile days with little time for stopping. But it did provide significant time at our major stopping points. We got off almost on time and headed for Indianapolis. We got to our motel in Indianapolis on schedule and headed for dinner. Then the Check Engine Light came on in the mini-van. OH-OH. So the next morning, we got up early and headed for the Dodge Dealer. The people at the Dodge Dealer were helpful and got to work as soon as possible. They said that the problem was the module that tells the automatic transmission when to shift (a part that never breaks). Because the part never breaks, they did not stock it and it would take a day to get one from Chicago. They said that it was possible to reset the computer, and that things would probably be OK until we got home. This would get us back on the road and still on schedule. We decided to take a chance with the temporary fix and got back on the road. Everything went as scheduled for awhile. In fact we found we had time for a couple of unscheduled stops in South Dakota- one to see the falls at Sioux Falls and one to see the Corn Palace in Mitchell, SD. Then after we completed the Black Hills portion of the trip. 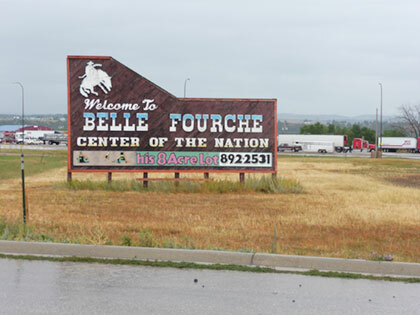 We visited Belle Fourche, South Dakota. This is the geographic center of the nation. We stopped there for a minute and then headed for the Devil's Tower in Wyoming. Then the Check Engine Light Came on. So we limped into Gillette, WY at 40 miles an hour because the car wouldn't shift into high. The next day (Monday) we went to the Dodge Dealer in Gillette and told them what we needed. They checked and found it would take two days to get the part from Denver. No choice but to wait in Gillette for the part. The people at White Energy Dodge in Gillette were absolutely great and we appreciate everything they did for us. We checked to see if we could get a rental car and do some sightseeing while we waited. Nothing doing. No rental cars available. So we just waited. 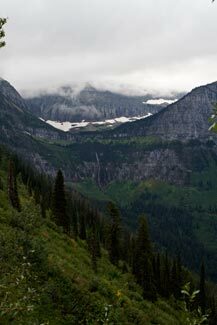 While we waited, my wife worked out a revised itinerary and suggested that we cut one day from the visit to Glacier then drive to Grand Teton National Park, and return home via the fastest route possible. This meant that the trip to North Dakota was out. The revised itinerary also meant an unplanned stop in Cody Wyoming. This turned out to be some compensation for the whole car problem and revised itinerary. 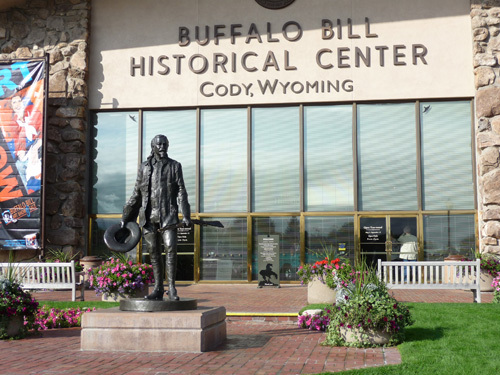 The motel in Cody was next to the Buffalo Bill Historical Center, which turned out to be an absolutely amazing place. During our drive to Cody, we saw a herd of wild mustangs. A bit of the old west. One of the main objectives of the trip was to paddle lakes in several of the national parks. We planned to paddle several lakes in both Glacier and Grand Teton National Park. Because of road construction in Glacier, we were only able to fit two paddles into our stay in Glacier--Swift Current Lake and Bowman Lake. Both of these were well worth the effort of bring Nessie along. The combination of time pressure and weather limited our paddle in Grand Teton to Jenny Lake. The pages in this this section of the site describe the trip, the places we stopped, the lakes we paddled, and some of what we saw along the way. Browse through the many pages here, and be sure to visit our Photo Gallery. Travels with Nessie Home :: Site Map:: Contact webmaster@ncsparks.com-email us:: Copyright Leslie Sparks 2006, 2007, 2008, 2009, 2010, 2011, 2012,2013,2019:: Last modified: November 24 2014.